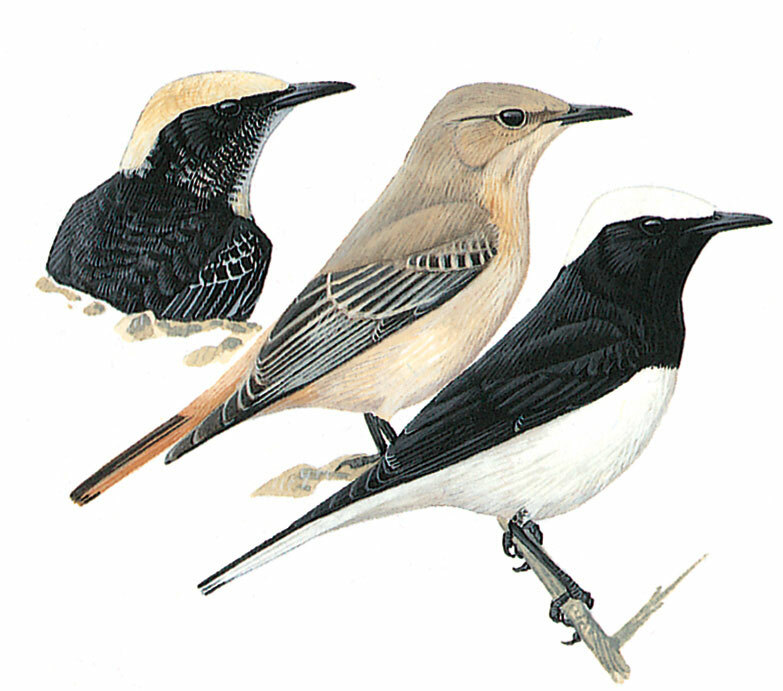 Large, slender, long-tailed and long-winged wheatear with long bill and buoyant, almost butterfly-like flight, recalling Spotted Flycatcher when catching prey, sometimes in long sallies. Distinctive male with black extending to centre of breast and, except for black central tail-feathers, nearly all-white tail with just black corners, provides easy identification. Autumn and juvenile male has whitish fringes to black throat, wing-coverts and mantle; also lower underparts, rump and sides of tail are tinged buffish. Female sandy brownish grey above, merging into creamy buff rump, tail-coverts and sides of tail in which central feathers and tail-corners are dark brown; whitish grey underparts washed buff at sides of breast, flanks and undertail-coverts. In autumn female and juvenile, the rump and underparts may appear reddish buff with almost reddish brown sides of tail, but absence of dark terminal tail-band separates from Red-rumped and Red-tailed.